"Gross was cast in the first production in the new building, Saroyan's The Time of Your Life. He took the non-speaking walk-on role of "Another Cop" to a new level. After helping stage management with pre-set he would get into his costume "and spend 20 minutes rehearsing my walk." His friend Kurt Fuller had told him something UC Berkeley professor Robert Goldsby had taught: "The character on stage with the greatest degree of conflict was the character who would get the focus." That was definitely on my mind as I walked in as Another Cop. There had to be some conflict. So he became a tired beat cop who had a slight limp because of bone spurs in the right heel. This fits under the 'art' heading," he laughed. Cast in the next two annual educational productions, he would drive to L.A. and Orange County schools each morning, then return to his facility duties in the afternoon. 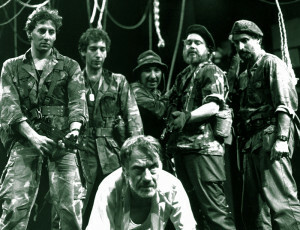 When Director Frank Condon, part of SCR's conservatory faculty, cast Gross in his staging of The Chicago Conspiracy Trial at the Odyssey Theatre, evening round trips to West L.A. were added to his routine. In 1980, David Emmes, SCR's other co-founder, was casting the world premiere of L.J. Schneiderman's Screwball. "The play was about a bunch of damaged youth," Benson said. "And Arye's crossed eyes really kind of worked: He looked kind of … well, screwy. Turned out, now in a lead role, we could see how really good he was. We had had other CETA employees who could swing a hammer, but they certainly weren't actors. We said, ‘This kid can act.’"
Screwball earned Gross membership in Actor's Equity, the stage actor's union. Then, shortly after its run ended, so did the CETA grant and SCR cut the cord. Condon stepped in with an offer to work with him at El Teatro Campesino in San Juan Bautista, and he would spend the next year in "this entirely different theatrical world. And it was fantastic." He worked on the first version of Bandito, with Tony Plana as Tiburcio Vasquez. In 1982, back in L.A., he held a series of odd jobs, including running lines with Jayne Meadows ("A fantastic lady") for a few years. After a meeting with potential first agents ended in rejection for "lack of experience," the agents appeared inexperienced by changing their tune hours later with a telephoned assignment to audition. 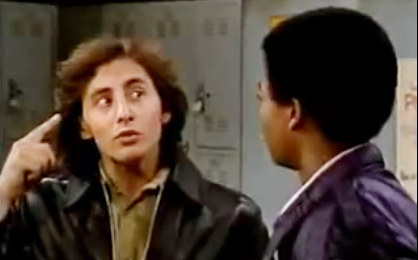 He got the job, a guest shot on "Different Strokes," and they got a client. More auditions followed but he "almost never got hired." Exceptions included episodes of "Knight Rider" and "Remington Steele." After auditioning for a movie starring Peter O'Toole he was excited to be called back to meet the film's director and director of photography. They chatted and sent him home, where the casting director reached him to say, "If you can somehow 'unwander' your eye within the next two weeks, you might be able to get the part. Otherwise, it absolutely isn't going to happen: The wandering eye thing makes a statement, aesthetically, that the director doesn’t want to make." He shared the story with friend and fellow Screwball cast member Patti Johns, who, as fate would have it, put him in touch with her husband, who was a cardiologist associated with USC. He told him flatly, "Get your stupid eye fixed," referring him to Dr. Robert Lingua, a pediatric ophthalmologist also tied to USC. "There's significant scar tissue from the previous surgery," Lingua said at the examination. "I guess you were, what, 4 years old when this happened?" The precision of that estimate inspired confidence, and Gross eagerly agreed to proceed. Two surgeries failed to improve things. Then Lingua suggested a procedure he had performed a couple dozen times. It was only "a little risky." "It involved the use of botulinum toxin long before botox was a thing," Gross recalled. He had to lay fully awake while Lingua probed for a functioning muscle in the good eye, paralyzed it with botulinum toxin and then, while keeping both eyes unfocused, make them drift up. He was then to focus on something that made them come down together, at the same rate and with the same effort. In the time it took for the botulinum toxin to wear off, his brain could relearn to make his eyes track together. "And that's what did it," he said. A few days of recovery and I was getting jobs "almost immediately." As the work increased, so did his awareness of the craft. By incorporating personal experience and emotional reality with research he conducted he was able to help writers define new characters and directors redefine existing ones. Most importantly, he was learning to keep it all loosely held, and respond spontaneously to what was happening around and within him. Director William Sachs recalled his 1984 audition for The Exterminator 2, a forgettable movie with the tiny part that became his film debut. "He came in and read for me," Sachs told a reporter. "He was talking like Marlon Brando, through his nose. It was fantastic, so I gave him the part. And when we did the scene, I said, ‘You’re not talking like you did in your reading!’ He said, ‘I had a cold.'" Larsen shared a more recent instance. "He always comes in with these choices," she continued, "but he's in the moment. He's not stuck. There are actors out there who would come in and have to stop while they tied their shoe. Or else they make a choice and that becomes the choice, for ever and ever. He's just not like that. He's just at the top of his game." But in 1985, the game was beating him, and he quit. It was after an audition for the part of a mime on an episode of "Growing Pains." Among the competition were "four of the best mimes in the country – capris pants, striped shirts, white face, the whole thing. These were the top movement artists around." He arrived, was handed the sides, and found his character's only line: "Hey." "I read it and I was in no mood," he said. "Is this the entire part? Anybody could do this! You don't need a mime. You don't even need an actor!" He went home and fired his agents. While telling the Odyssey's Ron Sossi about it he was offered Company Manager on Garry Trudeau and Liz Swados' Rap Master Ronnie, a send-up of the Reagan Administration. 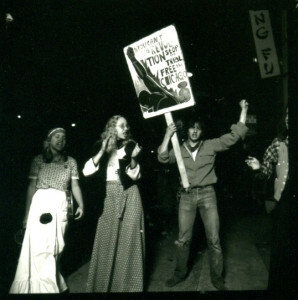 The show was moving to an AGVA run in West Hollywood. Still not looking for acting work. he was sought out and offered a role in Stein Winge's staging of Three Sisters, the show that would inaugurate the L.A Theatre Center. 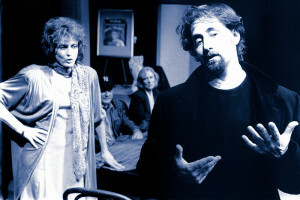 Winge, director of the National Theater of Norway, had drawn together a cast that included Meg Foster, Kim Cattrell, Ann Hearn, Stephen Tobolowsky, Angie Patton and others. During that run a friend insisted he audition for a film role the friend said "you could do in your sleep." Gross pestered casting director Melissa Skoff into letting him read for it. "Finally," he said, "I guess after they'd seen just about everybody in town, she agreed to let me come in." After nine callbacks, he was cast as star C. Thomas Howell's best friend in Soul Man. "They said 'We kept bringing you back because nobody could understand how you were able to do what you did in the audition. If you were that good why you didn't have a career already?" Feeling secure, he joked with the producers about how this had overturned a recent decision to quit. He shared the story about the ridiculous mime audition. Carol Black and Neal Marlens, the couple who were Soul Man's producers, laughed. "Oh yeah," one said. "We wrote that."